If your in the Club make yourself a GOLDMEMBER! Goldmember was a standout display bull at the 2003 National Western Stock Show. 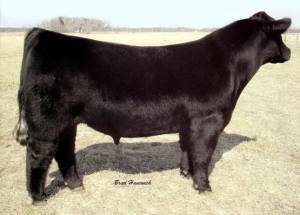 His maternal side is a highly proven and successful line of show champions. Goldmember is big footed with overwhelming body mass, bone and hair. He might be the link to siring highly productive females as well as steers.